Lottery winner and venture capitalist Montana Dayton is on vacation, sorely needing a break from her business. She purposely had a house built deep in the mountains, away from civilization in hopes to spend the winter alone with her dog Killer. Unfortunately, the universe is conspiring against her. Montana’s getting creepy feelings from something or someone on her property and Rose, her neighbor, is bringing new “friends” into her life.If Montana had known what she would be confronting that night, she never would have sedated Max. “Oh Killer, it’s so nice to almost be home! What a crazy last nine months. I almost forgot how beautiful the mountains are up here.” I sighed as I drove the narrow road with the hairpin curves. “Soon winter will be upon us.” I grinned. “All of those brilliant gold leaves on the Aspen trees will be bare against the Pine trees, and wow, the fresh air smells fabulous.” All of the tension left my body as peace from the surrounding mountains settled in. There was nobody else on the road, and as far as the eye could see were the reds, gold’s, and greens of the trees. of the bigger wildlife until fall when the elk seem to come out from hiding. That’s what I was hoping for on this trip. I’ve driven this road many times in my life and had different experiences each time I’ve come up here. Mountain lions have jumped out in front of my vehicle, racing to the other side of the forest in an awesome blur. I’ve seen bears, and twice I’ve stopped for a big herd of elk crossing the highway. A bit scary, but quite a sight. A few times I’ve felt like I was driving on a parallel plane. The trees and rocks seemed just a tad out of their original place. Some nights I the drive was peaceful, other nights I would get crept out on certain stretches of the road. And, of course, there were the times when the drive was surreal like now. Once I stopped to view the vastness of the Valles Calderas and one lone coyote walked right up to my truck. We checked each other out for about ten minutes before he took off back into the valley, very cool. I love these mountains and that’s why I chose to live here. I kept my eye out for elk as Killer lay contently next to me with absolutely no interest in what was going on around him. 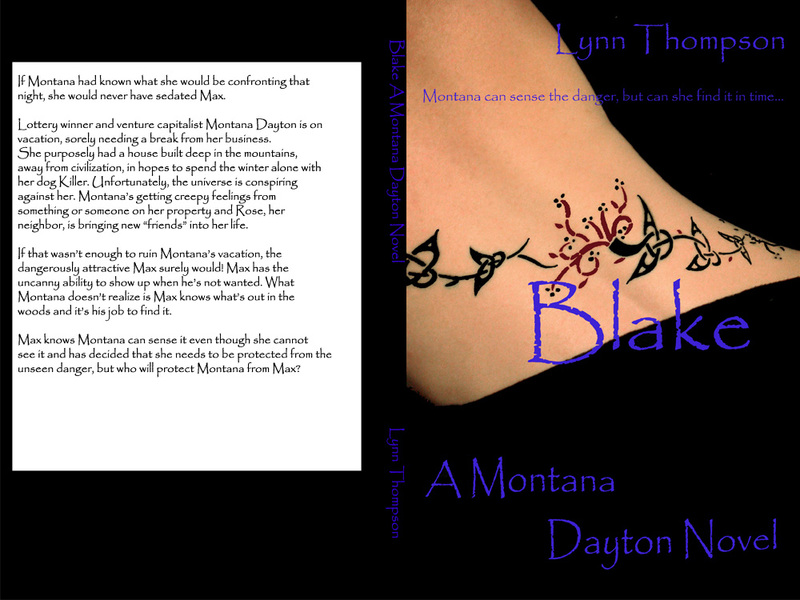 My name is Montana Dayton. I am officially on vacation. Killer’s my 6-month-old, 80 pound adopted chocolate lab/ bull mastiff mix puppy. He probably doesn’t have a vicious bone in his body. But when he runs, which is rare, he starts foaming at the mouth. He reminds me of Stephen King’s rabid Cujo. Right now he’s lying in the passenger seat of my truck with his head plopped down uncomfortably on my lap. “I have to admit I’m starting to get a little nervous.” Silence from Killer. I adopted Killer on a whim a week ago from my mother’s dog preserve in Hurley, NM. To be honest, he wouldn’t stop following me around. What’s a girl to do? Besides he’s cute and he doesn’t talk literally, I’ve heard a “woof” once. I can tell him all of my deep dark secrets knowing he won’t tell a soul, and his greatest quality is he doesn’t talk back. For the only man in my life, he’s perfect. I downshifted and turned on the gravel road in my big, gas guzzling Ford F-150, four wheel drive pickup, painted forest green camouflage colors. I then realized I’d made a great investment buying the truck. The ruts were horrendous and in major need of grading. I noticed the for sale sign on the truck and fell in love. I took the beast for a test drive and purchased it right away. Besides, does it really matter that I look like a teenager driving it? I’m 28 years old, 5’2”, and the steering wheel almost touches my chin for me to reach the gas pedal. The old Ford was already coming in handy. And looking younger than you really are is a good thing right? I gazed at the landscape around me as I worked my way around the ruts. Both sides of the dirt track were thick with big beautiful Pine trees, Blue Spruces, Aspen, and some Oak bushes. The sunlight sparkled off the leaves of the trees casting a shadowy, lacy pattern over us. My truck blended in with the landscape. My skin prickled with anticipation. I found the perfect piece of land for myself. It’s a three-mile drive up the dirt road before we reach the clearing to my house. A huge meadow sits behind my back door, forest surrounds the meadow, and a big stream runs through, with good fishing from what I’ve been told. There’s also a small wooden bridge that crosses over the stream to the other side of the forest, which is private property like mine. “Yes, my driveway is graded!” I exclaimed as we reached the house. My driveway’s shaped into a horseshoe for easy turn around access and is big enough to hold several vehicles. I pulled in, turned off the truck, and stared at the A-Frame house for a few minutes. We ambled up the stairs to the front door, which is off a full deck and went inside. On one side of the entrance way, a long dark skinny table sat against the wall with two top drawers. Below the dresser a braided rug covered the floor, creating enough distance underneath for shoes. On the other side of the wall was a coat rack, and in the corner by the doorway was a big bunch of rosemary hanging off a silver string. The rosemary enveloped the air with a nice pine scent. Through the entrance way is a big open space with a high ceiling and long ceiling fans hanging down. My living room sat to the right side of the entrance, and my kitchen sat to the left. Killer was lying on the big throw rug in the living room in front of a roaring fire at Roses’ feet. Rose sat in a big overstuffed chair eyeballing him. “Is he safe?” Rose asked, scrutinizing Killer. Rose didn’t seem to certain. I called Killer. He cocked his head at me, put his head on his paws and closed his eyes. “He doesn’t look like a puppy to me.” Rose examined Killer. Rose slowly got up and tiptoed around Killer. “He’s going to take some getting used to, but he does seem like a big softy. So, what do you think?” Rose asked, spreading her arms around. “I think the house is perfect.” One couch, one chair, an entertainment system with a big screen TV, stereo, two gaming systems, all the DVDs and dreaded exercise games I needed. “That’s the point.” I laughed. “No entertainment in my abode. Only me and Killer this winter.” Don’t get me wrong, I like people, just not all of the time. Besides, right now I’m on vacation. “Let’s go into the kitchen,” She sighed. “You really should be more social, meet more people, find a man, and have some kids. I don’t understand why you want to stay up here alone all winter. When you get old like me you can have your “peace” time.” She finger quoted peace and gave me a loving, but disappointed gaze. I slid my fingertips over the glossy black, with dark gray specks, granite counter top. The appliances were black, and exactly what I ordered. Black is a perfect color for someone like me. I have a bad habit of spilling dark drinks and food often. The tile floor was a beautiful Santa Fe Brown with stain guard, making it super easy to clean. “Solarium, then your room and bed. You can check out the rest in the morning.” Rose led me to the back of the house, past the downstairs bath, and we entered the solarium. The solarium windows were made out of thick glass. The windows allowed the natural sunlight and warmth in while keeping out the cold. Rose had planted my garden in this room a few months earlier, and the plants were already bursting with fruits and vegetables. I turned around in a full circle, admiring all of her hard work. “You’re an angel.” I smiled and aimed for the stairs. solarium. I climbed up the wood steps, walked through my office space, longed for my bed, and went straight into the bathroom. I think it took me two minutes total to clean up, strip, and fall asleep. The next morning I woke up to hot breath on my face and half of a dog lying on my chest. “Good morning to you too Killer,” I pushed him off me. I tried to roll over to go back to sleep, but he planted his big face right in front of mine. One “Woof”, he sneezed. I was now covered with dog slobber. I threw on some sweatpants and a shirt before plodding downstairs with killer on my heels. I smelled coffee as soon as I stepped into the solarium. Oh, thank you, Rose. Taking a short detour into the kitchen, I poured some coffee. I noticed the machine was on a timer before I headed for the front door. I stepped onto the deck. The morning chill caressed my bare feet. My java steamed in the crisp air and my feet were getting cold fast. I started to say “Hurry up Killer,” but he felt the same way I did. He’d already bolted inside the front door. “My turn,” I mumbled. I refilled my cup, took a long hot shower to warm up again, and applied a touch of makeup. A little blush, eyeliner, mascara, and I’m done. I stepped into my walk-in closet to rummage for some clothes and smiled. Rose had unpacked some of my boxes. I found worn jeans, a black long-sleeved, low cut, turtleneck sweater, some thick socks, black boots, and a dark green flannel shirt. After I dressed I went back into the bathroom and contemplated my hair. It’s fairly long, a tad wavy, (if I don’t brush it right away) and normally reddish blond. Right now it’s colored a rich dark auburn. I’d been debating on putting gold streaks in for the last week. But have been holding off out of pure laziness. I’ve got a small pink rhinestone stud in my nose and a belly button ring with pink dangling rhinestones‘. I’m slim, but still need to exercise. I’m the proud owner of five tattoos. Four of them are a Gaelic vine in different colors I drew myself, and one’s a phoenix. The Gaelic vines start on my left upper arm and travel up my shoulder. They snake diagonally down my back and end just past my right hip. The phoenix is on my right thigh. I had them draw the designs on me that way so I can cover them. I love tattoos. Unfortunately, some people look down on tattoo’s and think the worst. Contrary to their belief I very rarely drink and I don’t do any drugs unless you count caffeine a drug. I smiled and took another hit of coffee. In my line of business, it’s better to be able to cover them when I need to. I brushed my hair and proceeded to check out my loft. My bathroom was beautifully built with granite counter tops and tiled floors in bone-gray colors. Cobalt blue streaks wound through the bone gray, adding a touch of glamor to the bathroom. The shower’s built into the corner and my beloved Jacuzzi sat against the wall, both of them tiled in the same colors. I stepped through the door and into my bedroom. My queen size, four poster bed was placed in the middle of my room. I fluffed up the cobalt blue down comforter and wandered over to my dresser. I glanced in the mirror attached to the dresser and grinned. Could life get any better than this? I clicked on the track lighting strung across the ceiling above my bed. The cobalt blue vanity lights shined off my wood floor and radiated a soft glow onto the throw rugs. Rose did an amazing job decorating. In between my bedroom and the stairs was a small office space with a desk, computer, filing cabinet, and of course some rosemary hanging from a silver string. I breathed in the scent. I still had some unpacking to do, but it could wait. I walked downstairs, found a protein drink for breakfast, and searched for Killer. He was staring wantonly at the fireplace. He gazed longingly at the fireplace one more time before standing up and expelling a heavy sigh. I couldn’t help but grin as we walked through the solarium, he was already acting spoiled. I noticed more rosemary hanging from silver string by the back door. “I wonder what that’s about,” I mumbled under my breath as we strolled across the deck and down the stairs. Rose’s house was built behind and to the right of mine a short distance away. A small hard packed dirt road edges off the main drive to her house, so she doesn’t have to walk too far. It’s built similar to mine, except her loft’s the guest room, and her bedroom’s where my solarium is, just a bit smaller to accommodate an extra downstairs bathroom. I stopped abruptly halfway to her house. The hair on my arms and the back of my neck stood up on end. A creepy sensation settled over me. I glanced at Killer. He sat down, giving me his “what’s up” face. I slowly turned in a circle, eying the landscape and trees surrounding me. I checked out Killer again, no reaction from him. I didn’t see anything. The sensation didn’t last long before everything went back to normal. “What was that about?” I asked Killer as we started walking. I glanced at him again, not expecting him to answer and smiled. “Must be culture shock, straight from the wild city to the wild, peaceful forest.” My gut told me otherwise. I ignored it. “I might need a couple of days to adjust,” I said, shaking off the eeriness of the moment before. Killer and I halted again when we reached Rose’s front deck. We stared wide-eyed, taking everything in. Crystals, fairies, dragons, unicorns, and Pegasus’s covered her deck. Some were in the form of statues, but most were wind catchers, sun catchers, and chimes. Pots of rosemary sat on both sides of the entranceway and one sat in front of her door. Killer whined and planted himself below the steps. “Okay, you stay here.” I climbed the stairs up to Rose’s door, announced myself and tried to enter. How weird, I thought. The door’s locked. I knocked. Rose hurried out, quickly closing the door behind her. “My house is a mess. I’ll show it to you later.” She huffed, almost running down the front stairs. Rose was dressed in light teal leggings, a dark teal tie-dye long sleeve hoodie and bright red hiking boots. Her long silver hair was tied back in a braid with brilliant blue dragonfly rhinestone clips on both sides of her head, holding the wisps’ of stray hair back. Rose’s full name is Rosemary Parks. I used to work for her helping out around the house. Now she works for me, kind of. The deal is she can stay on as long as she wants for free as long as she takes care of the property while I’m gone. So far everything’s worked out great. She’s a little taller than me, but almost everyone is, a little rounder, and much older. I’ve never asked her age and she’s never told me. I do know she acts younger than her age and looks younger too. “Why so soon? I thought you’d be here another couple of weeks so we’d be able to spend some time together.” I said pouting. Rose’s kids live in Los Angeles, California and desperately want her to move somewhere closer to them. Rose can’t stand the smog or the noise pollution, so she visits for a couple of months once a year over the holidays to pacify them. I pondered that for a minute. No evil spirits were allowed on my land or in my house. I hardly ever got sick and negative energy was definitely not allowed on this trip. I could handle the rosemary, I’d just add it to the growing list of Rose’s little quirks. Bear, on the other hand, would hopefully be Roses age. I side stepped her and entered the barn. On the right, shelves reached close to the ceiling. Most of them full of odds and ends for my horse. A plank leaned against the side for a catwalk. On the top shelf was a huge orange tabby cat with yellow eyes. “She keeps the mice away,” Rose said. Pumpkin looked like she had her fill of mice, along with the dried cat food on the top shelf. The cat had to weigh 20 plus pounds. There was no telling where the hair ended and the fat began. Pumpkin hissed again louder, apparently she’d noticed Killer. Killer sat down and whined at Pumpkin. Pumpkin glared down at him. “I’m going to finish checking out the barn and say hi to Lightning.” I walked into the stall with Rose right on my heels. “There’s something else I need to tell you.” Her voice sounded rushed. I have four stalls in my barn and one horse. I found two. “Oh, you’ll like him. I offered him use of the barn in exchange for Chase.” Rose grinned. “Who’s Chase?” I asked, wondering if Rose was being vague on purpose. “You’ll like Max and Chase,” she humphed, putting her foot down. “Subject closed!” She stomped out of the barn. I blew out a breath and rubbed Aces nose. Ace gave me the impression he was a top breed horse, but I don’t know much about horses. He stood tall with a mix of gray and white hair, white mane and tail. Gorgeous. I frowned, my first day here and already I was becoming stressed. I closed my eyes, rolled my shoulders and relaxed by picturing his owner as a short, pudgy, balding, middle-aged man, who needed wolves, and a gorgeous horse to feed his ego. I smiled and held onto the image. Lightning’s my horse. She’s in the stall across from Ace. She’s a sleek black female with four white socks, black mane, and a black tail. I think she’s a mutt. She doesn’t carry the same princely demeanor as Ace. I adopted her down in Hurley because I wanted a sweet horse to ride up here. I grabbed a brush, stepped into her stall, and started brushing her, wondering again what had come over Rose. “Woof!” I snapped out of my zone, put away the brush, and went to make sure Killer wasn’t killing Pumpkin. Nope, he still had his eye’s glued to her, but now his tail thumped on the hay-strewn floor. I glanced up at the cat. Not too upset. Good. Previous Previous post: July/August sale half off better get while you can!!! !